Tacoma, Wash. — This week, Emerald Services was recognized by the Association of Washington Business with the 2014 Green Manufacturing Award; specifically recognized for innovation and operational excellence at its large-scale used oil re-refinery in Tacoma. According the Association of Washington Business, judges evaluated firms maximizing energy efficiency levels, going above and beyond regulatory requirements, minimizing waste from the production process and reducing their carbon footprints. A company’s ability to convert green manufacturing into a business opportunity was also considered. Emerald Services produces 11 million gallons per year of low-sulfur marine diesel oil (MDO). This product is created by refining used oil from the automotive industry through a state-of-the-art, falling film distillation process. This fuel provides a more ecological option for ships in Washington State and other western ports, allowing them to meet the new, low-sulfur emission standards. Emerald Services is serving an emerging market need driven by environmental regulation. This facility greatly expands the scope of the company’s service offering, its customer reach and marine sector integration, while demonstrating green manufacturing and economy leadership through environmental entrepreneurship. “A strong manufacturing sector is the foundation of a strong economy,” said Kris Johnson, AWB president. “These employers are doing their part to innovate, to make sustainability a priority and to find better ways to do business. Cadet Manufacturing (Vancouver), Ozone International LLC (Bainbridge Island), TigerStop LLC (Vancouver), and Manhasset Specialty Company (Yakima) were recognized in separate award categories. Emerald is the leading recycler of renewable organic by-products in the Northwest, providing recycling and recovery of solvents, antifreeze and waste oil. In addition, Emerald operations include fuel blending, chemical waste management, marine and industrial cleaning, waste and source reduction services, automotive and transportation services, and a variety of industrial services. This third-generation family-owned business is based in Seattle and employs over 350 people throughout the Pacific Northwest. Emerald’s family of companies is recognized for being one of the most progressive and successful sustainable businesses in the country. Formed in 1904, the Association of Washington Business is Washington’s oldest and largest statewide business association, and includes more than 8,100 members representing 700,000 employees. AWB serves as both the state’s chamber of commerce and the manufacturing and technology association. While its membership includes major employers like Boeing, Microsoft and Weyerhaeuser, 90 percent of AWB members employ fewer than 100 people. More than half of AWB’s members employ fewer than 10. 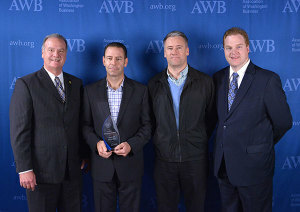 For more about AWB, visit www.awb.org.